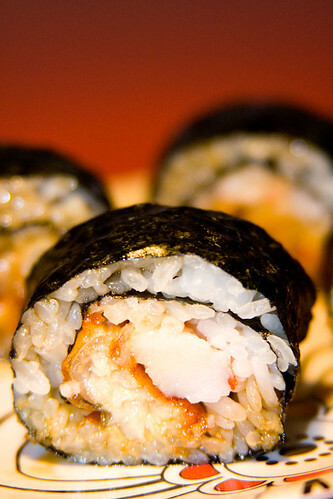 Who would expect to taste sweetness in sushi? Surprisingly, it’s possible without making one of those *candy sushi* things with rice crispy treats and fruit roll-ups. (Never tried them, and I’m not sure I want to… have you? If so, are they any good?) 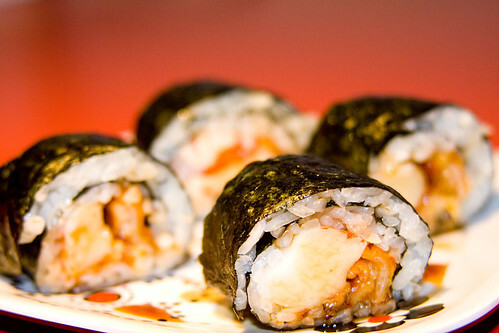 The combination of unagi and honey in the roll adds a sweet note to the roll, while the imitation crab and shoyu create a bit of saltiness in the roll. Believe me, it’s good! 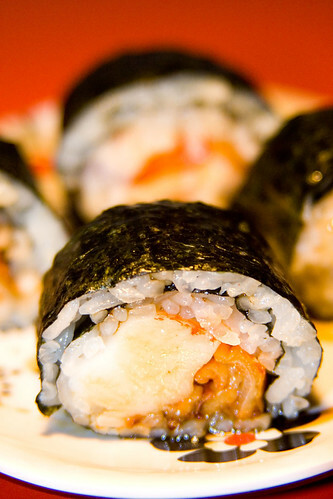 Roll the sushi, using unagi and imitation crab as your fillings. Mix equal parts of shoyu and honey, and drizzle over sushi. Enjoy! The Japanese use “tare”, a mixture of shoyu, sake, mirin and in some cases a little sugar for their unagi or anago (conger eel). Honey would be agood idea. My better (worse?) half uses honey instead of sugar any time she can in cooking Japanese or Chinese. The “eel sauce” I’m used to is rather sweet as well. As for the dessert sushi, I’ve seen some good “recipes,” but nothing I’ve had yet has compared to Koo-ki Sushi (http://www.kookisushi.com/), which is both gorgeous and incredibly tasty. Robert-Gilles – This doesn’t taste like eel sauce, although it is quite similar. I agree though, honey might be quite goo din eel sauce too! Devlyn – Ooh I’ve heard of Koo-ki Sushi, although I have never gotten an opportunity to try some. I’ve always wanted to though, it sounds really good! Honey! What a good idea! Did you find that it made the roll too soggy? I haven’t tried any of the ‘candy’ sushi’s but I’ve seen a lot of pictures. The ones in this link are by far the BEST I’ve ever seen. Incidentally, one of my favorite sushis that I kind of came up with (one of the first I ever made) is a simple roll with sticks of fuji apple or asian pear! Light and crisp with just the right amount of sweetness to balance against the sumeshi! Oooo I LOVE the Getty! I haven’t been there since I moved to LA (still here too!). Honestly I was more impressed and moved by the architecture than the exhibits 😉 Worth the journey up the 405 and up the side of that mountain! Oooh those do look good! If I ever have a lot of time on my hands, I am definitely going to have to try making those! I agree, the architecture is really impressive at the Getty! Last time I went to the LA Zoo was… uh… goodness probably back when I was in elementary or middle school! Long time ago. I have been wanting to go back for a while now, but haven’t gotten the opportunity to go. I recall it being pretty large, but of course seeing as I was a lot smaller than I am now last time I went, that kind of makes sense. 😛 Hehe I’ve gone back to a few places up north that I remember as being gigantic and end up being a little disappointed because now they seem so small! Mm, I love honey, and I bet it tastes great in sushi! Yesterday I made some sushi using some teriyaki sauce and smoked chicken. It was quite good, but I wouldn’t recommend using smoked chicken. Yep! It was pretty good. 🙂 Interesting! That sounds good! Thought I’d drop in a comment I was floating around the pages. I’m in to the same things a lot of you guys on here are taking what we have and know and putting it together. So with the question on the rice crispy treats and fruit roll ups, I’ve not done the fruit roll up thing. However One of my favorite things to watch people laugh after making them sushi which isn’t surprising enough to them with me being the person I am, I make my dessert roll. It’s pretty simple just rice crispy treat, cinnamon crumbles(made with cinnamon and butter), and peach, apple, or cherry pie filling. Depending on how tight you roll, concentrate on keeping the pie filling towards the middle the rolling will likely push out the goodness to the ends!! !